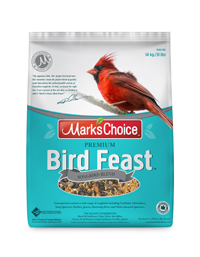 I am so proud of this mix that we decided to call it “Mark’s Choice Bird Feast in a Bag”. This is a carefully calculated combination of shelled peanuts, red millet, black oil and striped sunflowers, cracked corn, white millet, red millet, canary seed and unhulled sunflower seed. This is so close to perfection that the birds in your neighbourhood will have trouble moving from your yard into your neighbour’s where an inferior blend of bird seed is available. I think that your birds will enjoy eating it as much as we have enjoyed putting it to the test. Available in 4kg, 8 kg and 14kg bags.